Alex Ferguson – What would Fergie do? Sir Alex Ferguson’s unrivalled success at the elite level of European football has been an enigma. As he releases a new book about leadership, Edgar wants to know: how exactly do you win like Fergie? ‘Can Manchester United score? They always score.’ That instinctive commentary utterance from Clive Tyldesley in the 89th minute of the 1999 Champions League final has gone down in football folklore. Ferguson’s United were a goal down to German giants Bayern Munich with less than 60 seconds of their season remaining, having all but squandered their chances of a historic treble. But Tyldesley’s words were not provocative, nor were they forlorn. Manchester United did always score. And less than 90 seconds later, they had done so twice, eliminating Bayern Munich in the most devastating and tormenting fashion. 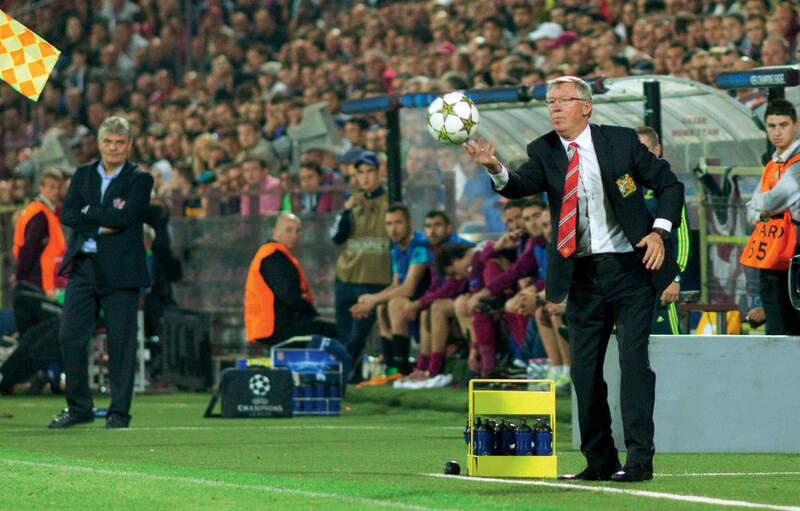 It was in the aftermath of that particular night in Barcelona that Alex Ferguson truly established himself as a contender for the greatest manager ever to grace the European stage. He was a merciless winner, collecting scalps across his industry. He exerted a riveting self-confidence, topped with a façade of power so fearful his opponents were often beaten before they’d stepped on the field. He was a bully, a warrior, an expert communicator, relationship developer, detail enthusiast, at times a sore loser, but always a winner. If you wanted to succeed, you followed Sir Alex Ferguson. His mantra served him well; going on to become Britain’s most honoured coach, during a managerial career stretching 38 years. Never based deeper south than Greater Manchester, Sir Alex Ferguson conquered every city he stepped foot in. If the unthinkable happened, and Ferguson failed, he spat and kicked, rebuilt, returned and won. Though his personality wasn’t adored by all, his leadership qualities were never met with doubt. He stood as the first line of defence for his team and led them forward year after year, regardless of who or what appeared ahead of him. No stone was left unturned. No position below number one was deemed acceptable. Some of his methods were aggressive. Others were focused on mentality; be it those of his players, the media, his opponents, his superiors, et al. But just how he combined his methods, ideology, psychology and attitude to lead Manchester United to no less than 38 trophies (winning 49 in total) is where the magic of the man truly lies. In his anticipated new book, Leading, he discusses such ideas, touching on key areas such as decision making, tactics, teamwork, and his management techniques. Fergie is currently giving a series of talks in the UK and America about what he reveals in Leading. Since his retirement from football in 2013, publishers, academics, politicians and businesspeople alike have been queuing up for some Fergie time. In the short stint he’s spent away from the pitch, he’s released multiple versions of his autobiography, one of the most highly anticipated football releases of all time, as well as given talks at the prestigious Harvard Business School. During his tenure at Old Trafford – the home of Manchester United – his football was watched in awe. However, today, the interest revolves around his skills as a manager, communicator, and a leader. So, just how exactly did one Scotsman take control of a working man’s football team in the North and drive it forward to become the most successful English club in history? He had a unique set of skills, a sharp tongue, an incredible resilience and an undying thirst for victory. One of the key pillars of management is managing staff. Former Manchester United striker Peter Schmeichel, part of Fergie’s illustrious 1999 treble winning side, recently said Ferguson was an incredible man manager, and to be that you have to know everyone. ‘So he knows everyone,’ he claimed. ‘Every single player in the club, every parent’s name, everyone who is employed at the club… He pointed out an under 17s kid at training to me once and said in 18 months he will play in the league cup, then appear on the bench once, maybe twice. He knew that particular player’s next 18 months.’ Ferguson was well known for harvesting young talent; when he unleashed the class of ’92, including David Beckham, Paul Scholes and the Neville brothers, it was seen as a huge risk. But Ferguson knew precisely what each player would bring to the team at that time. He had calculated each step of their progression. So confident was he in their ability, bearing in mind they’d just won the FA Youth Cup, that in the season break prior to their introduction he sold three of his biggest names without replacing a single one. Those kids went on to become the backbone of the side that won the treble just seven years later. Perhaps most famously, Fergie also nurtured the raw talent of Cristiano Ronaldo and showed ‘immense faith and patience’ with someone who didn’t show their full potential right away. Ferguson held a unique ability to not only be able to deal with young prodigies, but also well-established personalities. The general consensus was that if you went toe-to-toe with Fergie, you would end up getting the boot – perhaps even literally, as David Beckham will tell you. When you’re fortunate enough to have some of your industry’s greatest talents working for you, such as Fergie so often did, it takes a bullish and brutal character to cut them lose at the first sign of trouble. It’s common that many top level managers these days put up and shut up when it comes to challenging personalities so long as they’re performing. Never was this the case with Alex Ferguson. He set the standard from day one: no matter who you are, you’re never bigger than the club. ‘Most of Fergie’s players knew from the word go that to double cross him only meant one thing; you’d be out the exit door pretty quickly,’ says Hayters Teamwork Sports Agency’s Premier League Reporter, Stuart Appleby. ‘Jaap Stam, David Beckham and Ruud Van Nistelrooy, despite their talents, played the Scot at his own game and lost. He had an aggressive management style and was dictator-like figure, ruling the roost with an iron fist.’ In the latest version of his explosive best-selling autobiography, typically, he pulled no punches. Describing the exit of David Beckham, who was shipped off to Real Madrid in his prime, he said: ‘Beckham had to go because he thought he was bigger than the manager. David thought he was bigger than Alex Ferguson. You cannot have a player taking over the dressing room.’ In his new book Leading Fergie recalls how he learnt the importance of discipline as a boy growing up in Glasgow, Scotland. ‘Discipline was drummed into me from an early age. On school days, my dad would always shake my leg promptly at 6am. Maybe that’s why a couple of decades later as a manager I got into the habit of appearing at work before the milkman had arrived. I placed discipline above all else and it might have cost us several titles. If I had to repeat things I’d do it precisely the same, because discipline has to come before anything else.’ Fergie’s tenure in English football was shaped by bitter and feisty rivalries. When it came down to match days, Ferguson had the ability to defeat any team that confronted him. But his rivalries went deeper than that; his clashes off the pitch were often more nasty and challenging than those on. As the years went by, new rivals would appear, challenge, lose and disappear. The only constant that remained was Sir Alex Ferguson. One rivalry stood the test of time, and that was with Arsenal’s coach Arsene Wenger – but it’s fair to say Ferguson had higher priorities near the end of his career as Arsene’s side failed to challenge him for a title or trophy for the better part of a decade. Arsenal were well and truly at the mercy of Ferguson from the day after their somewhat lucky victory in the FA Cup Final in 2005, until the day he retired in 2013. Ferguson’s approach never allowed him to back down from a face-off. He was fierce in battle as well as in the media. When Wenger first appeared on the scene at Arsenal, Ferguson was famously quoted saying, ‘They say he’s intelligent, right? Speaks five languages? I’ve got a 15-year-old boy from the Ivory Coast who speaks five languages.’ ‘He had the ability to manipulate the media with mind games,’ says Hayters Teamwork’s Appleby, ‘Ranging from bringing up past conflicts or diverting attention to the opponent’s flaws in the build-up to big matches. It wasn’t off the cuff remarks; he knew what he wanted to say. At times, it felt like United were one-up before the game had kicked off.’ Other rivalries seemed to grow with whoever was in charge of Manchester United’s most bitter foes; Rafael Benitez’s tenure at Liverpool was littered with clashes with Ferguson, as well as Jose Mourinho’s first stint at Chelsea. Again, Ferguson didn’t hold back when it came to rattling the cages of his opponents. He came out fighting – he knew no matter what team he put on the field, if their mentality was right and the preparation was right, they would win. That confidence gave him the freedom to reprimand his enemies with bruising words at every chance. ‘I found Liverpool hard to watch when he [Benitez] was there. I found them dull. Benitez has more regard for destroying the game than winning,’ he once said of the former Liverpool coach. It wasn’t entirely true, as Benitez led his side to a European Cup in 2005, but it didn’t have to be true. It wasn’t always about fact with Fergie; it was about effect. When Jose Mourinho stepped onto the English football scene, he already had one up on Fergie after beating him with Porto in the Champions League a season before. But that appeared to spur Ferguson on, and when given the chance, he would talk down to Mourinho, often using his arrogance and confidence against him. ‘He was certainly full of it, calling me boss and big man,’ he once said of Mourinho. ‘But it would help if his greetings were accompanied by a decent glass of wine. What he gave me was paint-stripper.’ ‘There aren’t too many failures that spring to mind when revisiting Sir Alex’s career,’ says Appleby. ‘But his ability to manage expectations and the pressures at arguably the world’s biggest club was remarkable.’ The age-old cliché we haven’t failed, we just haven’t yet succeeded strangely sums Ferguson up. The day was never done until his team was victorious, and that came at any cost – even cancelling retirement.